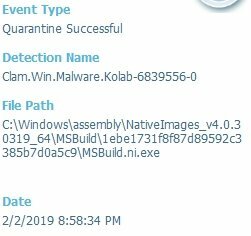 The file msbuild.ni.exe is being detected as a virus. I'm on 6.2.4.10819. This started tonight after I rebooted after updates. I have MBAM latest build and ran a full scan but does not detect the file as anything.